Even after a decade in the College of Science and going on a (slightly shocking, even to me) combined 24 years as a student and communicator at Texas A&M University, I never cease to be amazed by the absolute care and creativity so many of our professors put into their teaching efforts. Take, for instance, Texas A&M Mathematics’ Jill Zarestky, who each fall since 2009 has taught a first-year seminar course, Arts & Crafts & Maths, that explores the relationship between art, mathematics and a variety of crafting and fiber arts techniques, including knitting, crocheting, needlepoint, embroidery, cross-stitch, weaving and quilting. Zarestky, who has been knitting and teaching mathematics at Texas A&M since 2007, is active with the Brazos Valley Knitting Guild and regularly teaches knitting workshops and classes. This month, she also is a featured artist with the local Arts Council of the Brazos Valley. 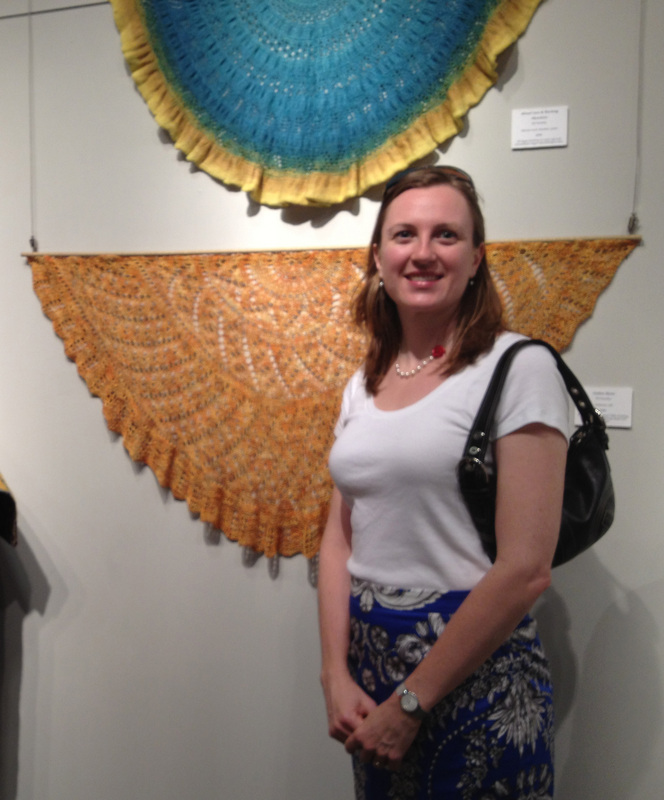 If you aren’t able to drop by the ACBV’s College Station headquarters to see some of her knitted works on display as part of the Fiber Arts: All Things Fiber exhibit, then check out her related guest post for their blog describing her insight into the connections between knitting and math. Jill Zarestky, in front of some of her work at the current Arts Council of the Brazos Valley exhibition. The human element: It’s alive and well in Texas A&M Science faculty and in the many personal touches, obvious and subtle, they bring to their classrooms. What valuable life lessons for us all. Bring your A game, folks, but don’t forget to pack your P (personality) one as well. This entry was posted in Mathematics, Undergraduate and tagged art of science, non-conventional teaching, personal touch by Shana Hutchins. Bookmark the permalink.